Since our inception, Monster Technology has prided itself on providing the highest quality imaging supplies at affordable prices to our customers. We understand what it takes to run a business, and setting yourself up for success starts with having the proper tools and equipment on hand. So whether you’re in the market for printer supplies, computer supplies, computer systems, office hardware, or something more, we have over 1 million products for you to select from to ensure your office runs smoothly. Let’s face it – trying to pick out the right toner can be confusing. Whether you’re looking for printer toner, copy toner, or toner cartridges in general, it’s more than just matching the correct ink cartridge with your particular machine. Instead, you’ve got options from various manufacturers at completely different price points. To make your next toner purchase easier, check out a quick explanation of the different types of toner that Monster Technology carries below. OEM (Original Equipment Manufacturer) toner cartridges are made by the actual manufacturer of your device. This means that you can purchase the toner designed by the manufacturer to accompany your specific machine. In fact, it’s the toner that the machine came with. Pros: OEM toner is the highest quality toner you can purchase for your device. It is reliable and produces quality in outputs and may even enhance the useful life of your device compared to your alternative toner options. Cons: OEM toner is more expensive than its remanufactured and compatible counterparts. It’s less environmentally friendly as well, as no parts of OEM toner are reused or recycled in any way before purchase. Remanufactured toner cartridges have some pre-used parts that have been put through a recycling process to be resold and reused. The cartridges are thoroughly cleaned, refurbished, reassembled, refilled with high quality toner, and put back together to meet the original OEM standards. Pros: Monster Technology’s remanufactured toner is made right here in the U.S.A. with virgin cores and new components. Parts that are reused are held to the strictest standards on the market. The price point for remanufactured cartridges is extremely affordable, and they are TAA compliant. It’s also an eco-friendly option, leaving a light carbon footprint. Cons: Sometimes quality control can be an issue, but working with a reputable imaging supplies company that backs their remanufacturing process like Monster Technology mitigates this con. 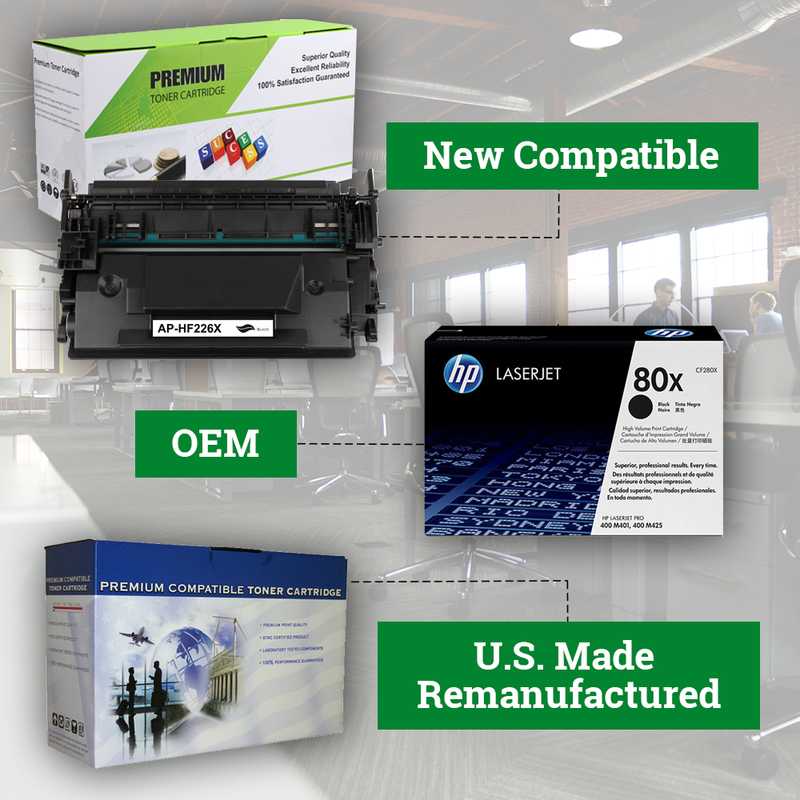 Compatible toner cartridges are generic or aftermarket toners that are created from all new parts by independent companies that are unaffiliated with the Original Equipment Manufacturer (OEM). These products are imported from overseas, making them extremely affordable. Pros: The price point of compatible toners is typically the most economical option available. Cons: International ink manufacturers are not held to the same quality assurance standards as those based in the U.S., but working with a reputable partner who enforces strict quality control standards and accountability on their international vendors like Monster Technology mitigates this con. If you’re interested in learning more or have unique questions about your office imaging supplies, use the form to the right to contact us. We would be happy to assist you with your next purchase. Or, take a few minutes to browse any of the 1 million+ items listed at our online store. Can’t keep up with ordering toner? Check out our Managed Print Services, which comes with automatic replenishment of toner as a standard feature – so you’ll never run out of ink again.